Professor Awh and his research team located a simple oriented bar within a circle in short-term memory to capture synchronized neural activity. By monitoring alpha rhythms, Professor Awh was able to decode the precise angle of the bar, which student subjects were locking memories onto, and then he used that brain activity to predict patterns in which individuals could store memories with the highest quality. In past investigations, researchers mainly used functional magnetic resonance imaging (fMRI) and successfully decoded thoughts via brain activity. However, those approaches were expensive and failed to track fast-moving mental motion. The novel discovery at the University of Oregon, Eugene showed that EEG measures of synchronized neural activity could precisely track the contents of memory with a much higher temporal resolution of about one-tenth of a second compared to about five seconds with fMRI. This groundbreaking research indicated strong evidence that these electrical oscillations in the alpha frequency band played a key role in a person’s ability to store a limited number of items in working memory. By identifying particular rhythms that were important to memory, Professor Awh’s research team was getting closer to understanding the low-level building blocks of the brain’s really limited cognitive ability. The research helped researchers understand that human brain was quite restricted. That is one of reasons that people can only think about a couple of things at a time and miss things that would seem to be extremely obvious and memorable. This research in general provides insights into the basic capacity limits of the mind and is a research program funded by the National Institutes of Health and National Institutes of Mental Health at the University of Oregon. The University of Oregon is among the 108 institutions chosen from 4,633 U.S. Universities for top-tier designation of “Very High Research Activity” in the 2010 Carnegie Classification of Institutions of Higher Education. The university is also a richly funded research marketplace. The university spends currently totals approximately $75 million annually. The University of Oregon received more than $26 million in research funding from the National Institutes of Health in 2013 and more than $15 million as of July 2014. Biotechnology Calendar, Inc. is providing an opportunity for laboratory supply companies to connect with the University of Oregon at the 4th Annual BioResearch Product Faire™ Event on September 9, 2014. 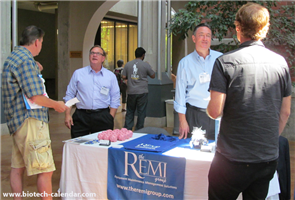 Last year, the BioResearch Product Faire™ Event at the University of Oregon, Eugene attracted 99 attendees. Of these attendees, 17 were purchasing agents, professors and post docs, and 8 were lab managers. These attendees came from 7 different research buildings and 10 on-campus departments. If you are a laboratory supply company interested in exhibition at the 4th Annual BioResearch Product Faire™ Event on September 9, 2014, please click the button below for more information. Each year, Biotechnology Calendar, Inc. provides nearly 60 BioResearch Product Faire™ Events at different institutions across the nation. Please read the National Show Schedule for 2014.